"A perfect opportunity to enjoy a peaceful hideaway." 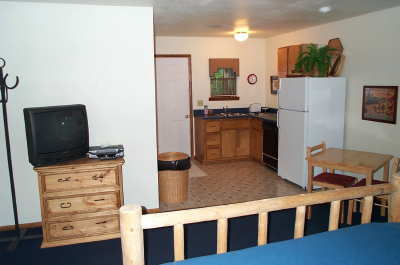 has 2 bedrooms, a living area, kitchen and full bath (tub/shower). Each bedroom has a double bed. The kitchen includes a full-size refrigerator, two-burner cook top, dishwasher, microwave and coffee maker. Near the screened porch and deck there is a charcoal grill. The cabin has DirectTV, DVDs and central heat and air. is a one-room cabin, built on a raised platform and hidden among the trees. It has a kitchenette, bathroom with shower and a king-sized bed. It is equipped very similarly to Mountainview.